Author(s): Mohamed Shaban, Nanophotonics and Applications Lab, Department of Physics, Faculty of Science, Beni-Suef University, Salah Salem Street, 62514, Beni-Suef, Egypt. Mona Ali, Kamal Abdel-hady, Hany Hamdy. In this paper, a facile method to fabricate two-dimensional (2D) Sn nanoparticles is demonstrated. Sn nanoparticles are deposited on porous anodic alumina membrane (PAA) by using thermal vapor deposition (TVD) technique. 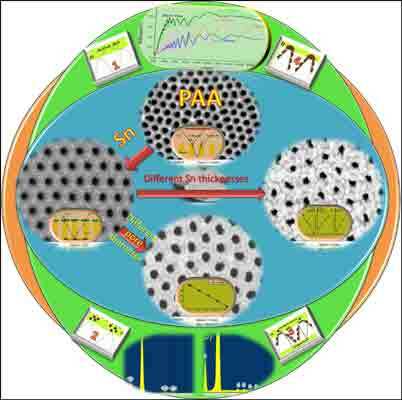 A set of PAA membranes fabricated under the same conditions was coated with Sn for different periods of time. SEM images showed the formation of hexagonal nanoarrays of Sn around each nanopore following a selective agglomeration growth mechanism on the active dots of the PAA surface. As the deposition time increased from 1 to 3 min, the agglomerated particles height increased from 20 to 75 nm. Moreover, Sn was thermally deposited for 2 min onto PAA substrates of different pore diameters. As the pore diameter increases, the formed Sn particles diameter decreases and their density distribution around each pore is improved, which may be attributed to the dimensions of the active area of the PAA surface. According to reflection spectra, it was found that the oscillation strength of the samples increased as the deposition time increased to 2 min. For the time greater than 2 min, the oscillation strength decreased due to the scattering of light, particularly in the short wavelength region, that caused by the increase of sample roughness. Keywords: Growth mechanism, nanoparticles, porous anodic alumina membrane, reflection spectra, thermal evaporation technique. Affiliation:Nanophotonics and Applications Lab, Department of Physics, Faculty of Science, Beni-Suef University, Salah Salem Street, 62514, Beni-Suef, Egypt. Keywords:Growth mechanism, nanoparticles, porous anodic alumina membrane, reflection spectra, thermal evaporation technique. Abstract:In this paper, a facile method to fabricate two-dimensional (2D) Sn nanoparticles is demonstrated. Sn nanoparticles are deposited on porous anodic alumina membrane (PAA) by using thermal vapor deposition (TVD) technique. A set of PAA membranes fabricated under the same conditions was coated with Sn for different periods of time. SEM images showed the formation of hexagonal nanoarrays of Sn around each nanopore following a selective agglomeration growth mechanism on the active dots of the PAA surface. As the deposition time increased from 1 to 3 min, the agglomerated particles height increased from 20 to 75 nm. Moreover, Sn was thermally deposited for 2 min onto PAA substrates of different pore diameters. As the pore diameter increases, the formed Sn particles diameter decreases and their density distribution around each pore is improved, which may be attributed to the dimensions of the active area of the PAA surface. According to reflection spectra, it was found that the oscillation strength of the samples increased as the deposition time increased to 2 min. For the time greater than 2 min, the oscillation strength decreased due to the scattering of light, particularly in the short wavelength region, that caused by the increase of sample roughness.